"rorrim" is only $16.00CAN plus shipping and taxes where applicable! You can always trust the guys from Austere to approach music in an intelligent and creative way. And with the release of their latest disc "rorrim", they approach it from two separate ways, each ending up at the same point, which is, of course, twice as clever as most artists. The idea is that each track on the disc is a reflection of itself, that the music is identical when played both forwards and backwards. And while that sounds more than a little loopy, in practice it actually sounds quite impressive. "cucE" formally opens the disc, using long drawn out pads to create a space within the soundfield. Tones drift and sway throughout the track creating reference points for the listener. Sounds rise and fall, drift to the left and right, and float around the space providing a sense of movement through a three dimensional plane. Logically I know that the track reverses itself at the half-way point, but the sounds are so well crafted, so richly textured that I can't really identify them as a backward track as they exist so well as independent sounds. Transitions are smooth and easily made, and it's all quite impressive. "sevvaW" follows, a spiraling drone that rolls around the track against a deep pad backdrop. It's a shorter track than "cucE" and so the reversal of sounds is a little more apparent, but that said it's still just as effective, still just as successful as the first track. By this point the concept behind the disc is secondary in my mind to it's execution and I'm no longer looking for the midpoint of the track where tones reverse, instead I'm just letting the music wash over me. Track four "wolloH" begins with a quiet drone that gains volume as the track progresses, slowly shifting through a spectrum of sounds during the length of the track. It's a very subtle track, a very minimal approach to music, but it's a very effective one, very much in keeping with the kind of work that I've come to associate with Austere. "etercseD" opens with a higher tone, playing overtop a low rumble. 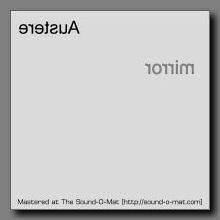 A sparse and simple melody (a mirror within a mirror!) is repeated throughout, creating an almost oblique sense of motion in the track. It's a study in discreet movement and minimalism and as would be expected, the Austere folks carry it off admirably. "llebatiC" is the sounds of rotating organs, movement in a well of sound. It's another short track, so the sounds played retain a certain familiarity for the listener, but it's still well crafted and impressive. And perhaps that's a good way to end the disc, so that we're reminded of the idea that links all of the tracks and we can marvel at the talent and skill required to do something like this so well. A part of me feels that I'm letting my readership down by not being able to write a review in keeping with the "rorrim" ideal, a review that wraps around itself and reads in some form of palindromic critical analysis. I'm not going to worry about that too much though as I'm sure by now you've recognized that I think "rorrim" is a very clever album with a very interesting idea that is performed and executed with all the mastery and skill that I've come to expect from Austere. Without doubt, "rorrim" is a great disc, whichever way you look at it.